Welcome to Lina´s Rolli´s (NPO) - linasrollis1s Webseite! In Nov. 2016, Lina was born with spina bifida and hydrocephalus. In addition to other problems, SB/HC usually also affects the legs. Due to this handicap, the children are dependet on a wheelchair all their life. But also diseasis such as spinal muscular strophy (SMA), stroke and many other diseasis affect the children in their development. 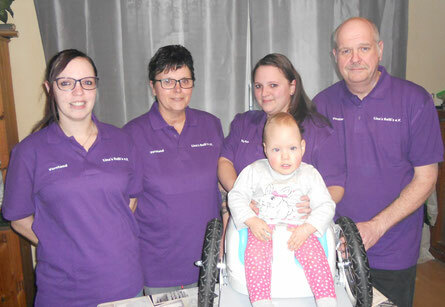 In Germany, children usually only get a wheelchair from the helth insurance company when they are 2 years or older. But what about early childhood development ? Healthy children begin to crawl at the age of 10 month, then follow the first steps, they explore their home, the language development is stimulated, the spatial vision is trained, they can move independently. Children with handicaps can not do that, they are lying in one place, they are sitting in rehabilitaion chairs. Why should these children make the important development only at the age of two or more ? The material for a Lina Rolli costs € 110,- and is financed by donations. Affected families pay only the fright costs, the wheelchair is provided free of charge. We build the chairs with different "bumbo" seats and in special cases with a high backer. Decisive for the chois of seat are the dimensions of the child, which must be entered in a form. The families then get our infopost, here a liability exemption must be signed, information about the child must be made. In addition , we need a medicale record on witch we can see the name of child and the diagnosis. with it we protect the association against abuse. When the child has grown out of the seat, the families get in cotact to us. We also have a "Rolli-Paten" program. When someone pay´s a hole chair, he will be godfather of this chair. The chair get a sign with the name of the godfather. To do this, the godfather must specify in the transfer "Spende Pate Linas Rollis"
If a family got a wheelchair from us, please ask you friends for a little donation to us. Help us so we can help !